Please select an option White Heather grey Black Pink Sky blue Please select a color. Please select an option 6m bodysuit 12m bodysuit 18m bodysuit 24m bodysuit Please select a size. Happy Halloween all new moms and dads! Are you getting ready to celebrate Halloween with your baby for the first time? These cute Halloween baby onesies are perfect shirts for your baby boy and baby girl to celebrate their first Halloween with! 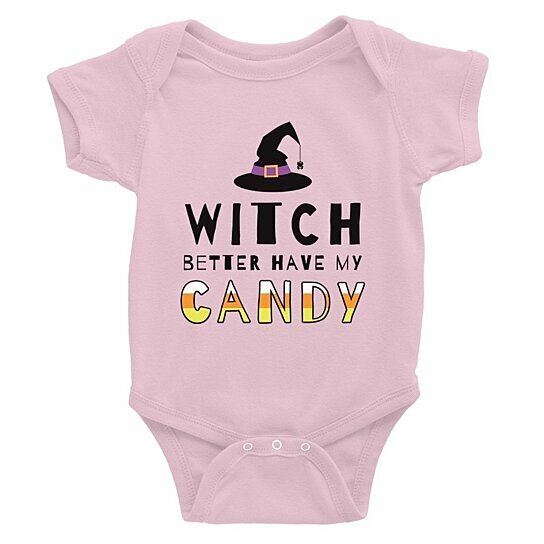 Make the last day of October wicked and haunted with these cute baby onesies and t-shirts that show cute and humorous zombies, monsters, vampires, witches, and more. At 365 In Love/365 Printing Inc, our baby graphic onesies and infant tees are made of breathable lightweight ring spun cotton that ensures comfort. They are worry-free prewashed shirts that prevent from any significant shrinking after the first wash. Not only that, our baby onesies come with three super easy snap closers that will make things easy for all new parents to change their babies' clothes and diapers easily and quickly. All our designs are created, printed and shipped from California, USA. Hundreds of cute, funny, and unique designs provide a wide range of gift options for baby shower gifts, baby birthday gifts, and new parents gifts. Get your Halloween baby shirt at 365 In Love/365 Printing Inc. Have a spook-tacular Halloween this year with your little one!